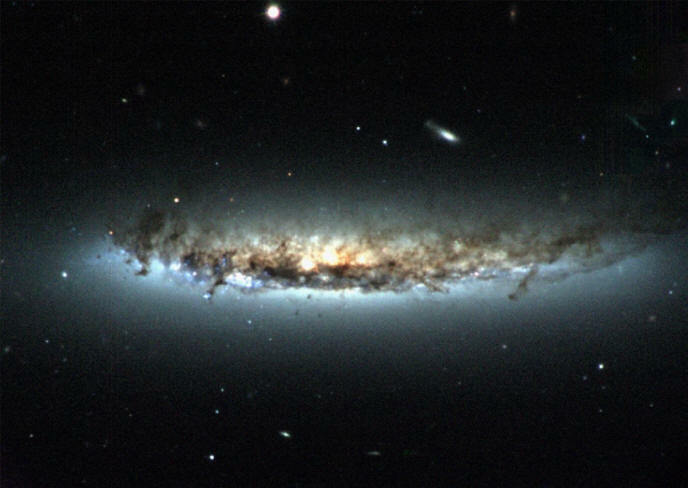 Streaming gases in NGC 4402 distort its shape into a bowl. Credit: H. Crowl (Yale University) and WIYN/NOAO/AURA/NSF. Some galaxies exhibit broad tails, as well as bright comas of gas surrounding a central nucleus. What is a comet? An astronomer might remark that a comet is a small, fragile, irregularly shaped object composed mostly of water ice and dust, along with carbon and silicon-based compounds. "Dirty snowballs," as Fred Whipple described them in 1950. Consensus opinions continue to support the theory after almost 60 years. According to Whipple's proposal, as a comet approaches the Sun the "hot" solar wind transforms the solid nucleus directly into a vapor through sublimation, bypassing the liquid phase. Material from the nucleus begins to expand outward, forming a cloud of gas and dust otherwise known as the coma. 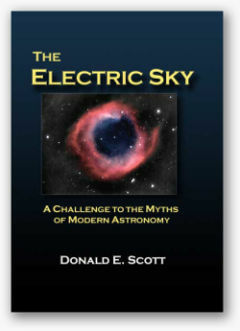 Sunlight and the solar wind interact with the cloud to form a long tail. However, ask an Electric Universe advocate what a comet is and a different answer will be forthcoming. Comets spend most of their time far from the Sun where the charge density is low. Since comets move slowly, their electric charges reach equilibrium with the weak, radial solar electric field. When a comet falls in to the inner Solar System closer to the Sun, however, its nucleus accelerates into regions of increasing charge density and varying electrical flux. Polarity and charge characteristics in the nucleus respond to the increasing solar forces, forming a coma (charge sheath) around it. Discharge jets flare up and move across the surface very much like the plumes of Jupiter's moon, Io. If the internal charge imbalance becomes too great, the nucleus may explode like an overcharged capacitor, breaking into fragments or vanishing forever. Similar effects are most likely responsible for meteoric explosions in Earth's atmosphere, such as the one that occurred over Tunguska in Siberia. Surprisingly, a recent article describing the Hubble Space Telescope repair mission highlights two different galaxies within the Virgo Cluster that seem to exhibit comet-like characteristics. As NGC 4522 and NGC 4402 move through the intergalactic medium, they are being distorted by "strong winds." Astrophysicists say that the galaxies are plowing through gas and dust, so are experiencing "ram pressure." On Earth, ram pressure is known as "drag," and results from air friction. In the case of the Virgo Cluster, researchers suggest that its mass of hot gas and dust is acting in the same way, forcing the material in both galaxies back against their apparent motion and causing them to form comas and tails, as well as a distinct rounding of their forms in the direction of travel. "This unique galaxy, situated 3.2 billion light-years from Earth, has an extended stream of bright blue knots and diffuse wisps of young stars driven away by the tidal forces and the ‘ram pressure stripping’ of the hot dense gas." 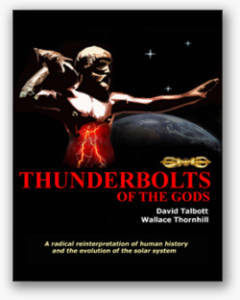 In past Picture of the Day articles, shock waves, hot gas, and collisions in deep space have been discussed. 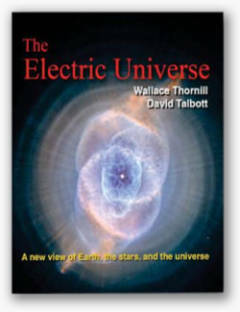 They are often used to describe the phenomena that create high-frequency electromagnetic radiation in the cosmos. From gamma rays down through x-rays and extreme ultraviolet, conventional theories have relied upon gravity and acceleration as the only way for them to be produced in space. In other words, kinetic energy alone, without recourse to electrical explanations, is responsible for what we see and detect with our instruments. This situation is born from the gravity-only theory of cosmic evolution. Since comets hold a highly negative charge, they attract the positively charged solar wind ions, accumulating an immense envelope of ionized hydrogen, up to millions of miles across. Perhaps galaxies embedded within their clusters experience something similar. Perhaps cluster cores generate significant streams of charged particles that flow outward much like the solar wind. If galaxies within a cluster are oppositely charged from the cluster core, the core will pull them in toward the region of greatest charge density: they will experience "anomalous velocity." If there are regions of charge separation within a galaxy (such as NGC 4522 or its companion), then the material that is the same polarity as the cluster core will be blown back and away, again much like the coma and tail of a comet in the Solar System.